Converter is intended to use with PC computer to communicate with ROV using 2 wires in half duplex mode. Send/receive mode is selected by RTS signal. The converter was designed to be as simple as possible, so it has no some features that can be found in commercial grade products (e.g. galvanic separation). Popular chip MAX232 is used to convert RS232 signals from/to TTL level. 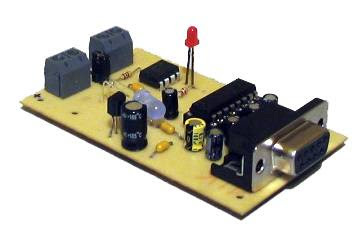 MAX485 converts TTL level signals to RS485 standard. RTS line is used to change transmission mode of MAX485. RTS signal is first converted to TTL level by MAX232 then connected to DE and RE/ pins. 2 LED are used to indicate current state of the interface.